I confess that I favor natural hackles, hairs, feathers, and dubbing. Naturally, I don't have more than a feeble justification for my preference in some areas; life would be boring if it was always bolstered by logic, rather than supported by pure, obdurate, obstreperous opinion. Despite Veniard's longstanding offering of superb dyes, if we examine any dry fly plates from the 1920s-1950s we would be hard-pressed to find a color of hackle, feather, or dubbing that could not be found in the natural form. Natural hackles cover an amazing range of colors and tones, without need for dying. The same is true of feathers. Hairs were not often found in classic dries, but the various gray and brown furs used for dubbing in that period were available fresh from the pelt, undyed. While at one time, a natural blue-dun cape was almost a thing of fiction, today they are readily available. There is really no reason to purchase a dyed material for classic dries. OTOH, there are some reasons to keep all of our feathers in the natural state. Feathers, like the wings of butterflies, use "structural coloration"; that is, the tiny layers of chitin comprising the feathers are layered in such a way as to refract the light and produce the native color. Other materials, like furs, use pigmentation instead. To cover the structural color with a dye is to remove much of the innate translucence of the feather Dying may also radically alter the natural ultraviolet reflective characteristics. 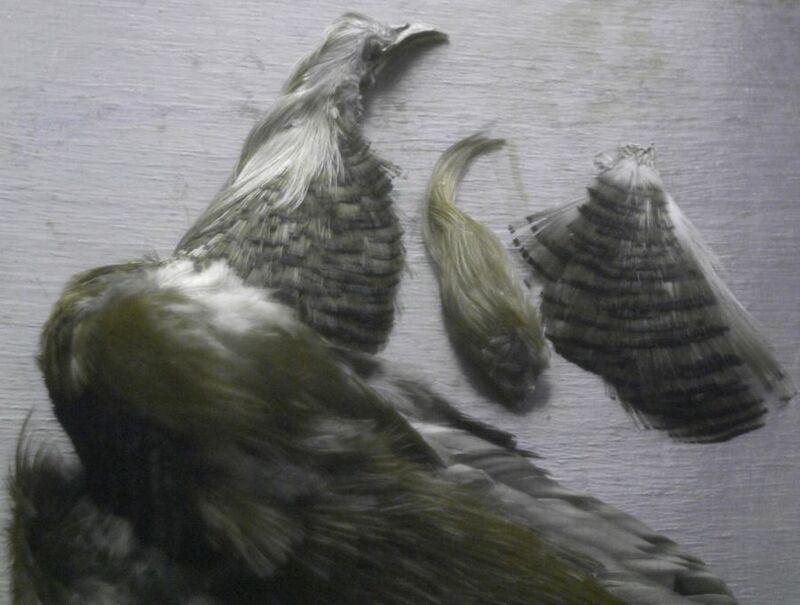 OTHER, is my category for treated feathers and furs that do not appear treated, as well as honesty markings. Many white feathers and furs appear "whiter than white". This is because they have been treated with a brightener, typically TiO2 -- Titanium dioxide. TiO2 is used in most outdoor paints to absorb UV. It was even added to skim milk to impart a bluish color. TiO2 is fluorescent and the blue that it fluoresces makes it seen "whiter" to the human eye. However, the TiO2 absorbs UV, so the material would be seen as darker by the trout, which can see in the UV wavelengths. This was impressed upon me years ago when giving a lecture on UV vision at a FFing club. A member came forward with two white marabou streamers. He told me that his old marabou still worked but a recent supply was not nearly as effective with the trout. When photographed in UV, the difference in UV reflectance was obvious -- his new stock of marabou had been treated with TiO2 and reflected little UV, the untreated marabou was bright in the UV. Do you like natural materials in preference to dyed? Absolutely, especially for my trout flies. I forgot to mention honesty markings. Honesty markings are patches of UV-reflective feathers on the male bird which fade with age (think gray hair.) The female can use these to choose a virile younger mate rather than a less healthy, older bird. Honesty markings are less of a problem now, as we get most of our feathers from farm-raised birds killed at their prime for the feathers. 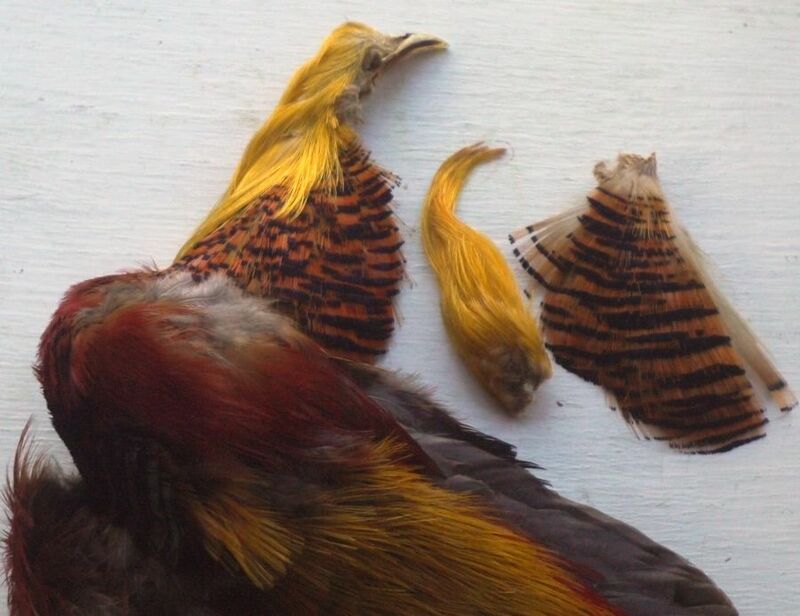 Here is an example of honesty markings on Golden Pheasant crests. The crest on the left is a young(er) bird. Just something to make us think about how our tying uses the natural world. While I use natural stuff as often as I can, mostly always have, I admit to liking certain dyed colors especially dyed grizzly feathers. In the salt they just look cool, and on certain flies, think renegade with chartreuse on one end and Orange on the other, are a hoot to fish. Rarely. When Troy take them I recommit to thinking color only matters when it does. And like I said earlier, I save certain flies like an Adams, red quill or Wulff until special times. I haven't been on this forum in a long time, so I'm not familiar with the local patois. I do not understand "When Troy take them I recommit to thinking color only matters when it does." Please translate. Thanks. I also don't understand why you reserve certain flies for certain times. Or why you use classic dry flies in the salt. I've come to appreciate natural colors more since starting to tie classics. Specifically, the Catskills dries. Sorry stupid phone autocorrect on take to Troy. Not sure where I said I fish dries in salt, although I've cauggt trevally and jacks on poppers. But they are floating flies. The limit is self imposed. I only allow myself two fish on one fly pattern because what more is there to prove? The pattern worked, so I change patterns to see if something else will fool a trout. 99% of the time I only use dries for trout fishing. The other bit us for wet flies. If trout won't rise to a dry, I do something else because trout should have the sanctity of depth to rest and be safe. The addiction to using bobbers and two bead head nymphs is akin to spin fishing, which I gave up for fly fishing nearly 40 years ago. There's no justification for opinion or style though. These are mine. Of interest to some, may be the fact that iridescent feathers lose their iridescence under water. All iridescence in feathers is created by air gaps between chitin layers; when these fill with water that special spectral magic is gone. trout dry flies...i use natural hackles 100%...take a dyed hackle and a natural and hold them up to a light source. the natural shine the dyed is flat. i've found that the only thing you need in the salt water is natural white bucktail. anything else attached to the hook is unnecessary...but how much fun would it be as a fly tyer to use only bucktail? It sounds like the opiniins are from our writing friends. Fair enough. I've always said I don't care how anyone fishes because fishing is fun. As long as they oney laws. In addition to my previous expose on my style, I always flatten barbs even in the salt. Tough duty on your health. Please keep us in that loop. For my part I do wish you the best. Oh, and for the record, I rarely wear waders. Just wading shoes. Haha. Sounds like a good pattern. Can't imagine using tinsel on a dry fly though. Maybe a grizzly quill. True. Keep trying. Never leave rising trout. I saw an article once where the author applied a gold tinsel body beneath the dubbing on an Adams dry, after the fly was wet, it looked pretty interesting, Ive tied a few myself but hadnt fished much of anywhere with a dry the past few years. I can attest to flies like the green bottle or the blow fly fished in NZ. I have a few clients every year that come back with fun stories from there and Chile using flashy dries like that.